Queues de langoustes grillées Kinshasa is a collaborative effort. 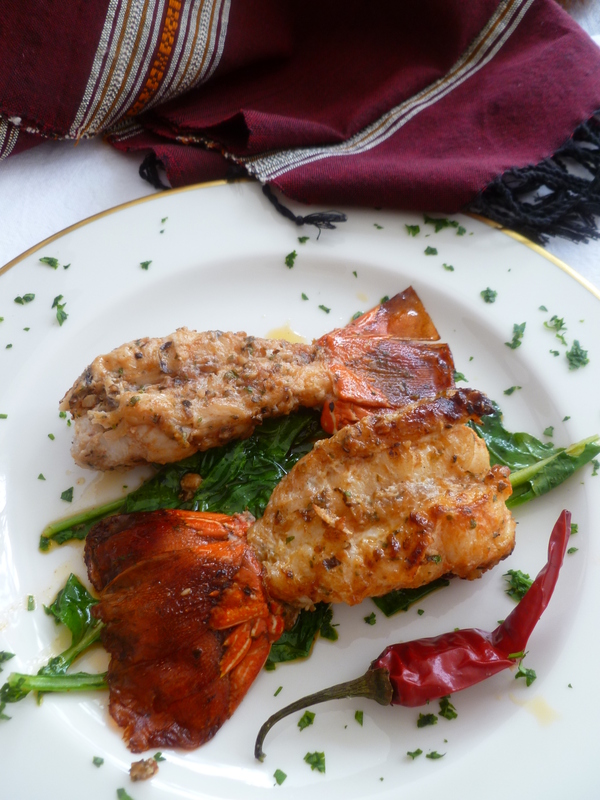 The marinade comes from the diplomatickitchen, one that successfully prepares a crustacean of any sort for grilling, either in the kitchen on a stove-top grill or out-of-doors. A very capable chef in Kinshasa improved on the original recipe with his neat method for grilling that contributes to the beauty of the finished result. 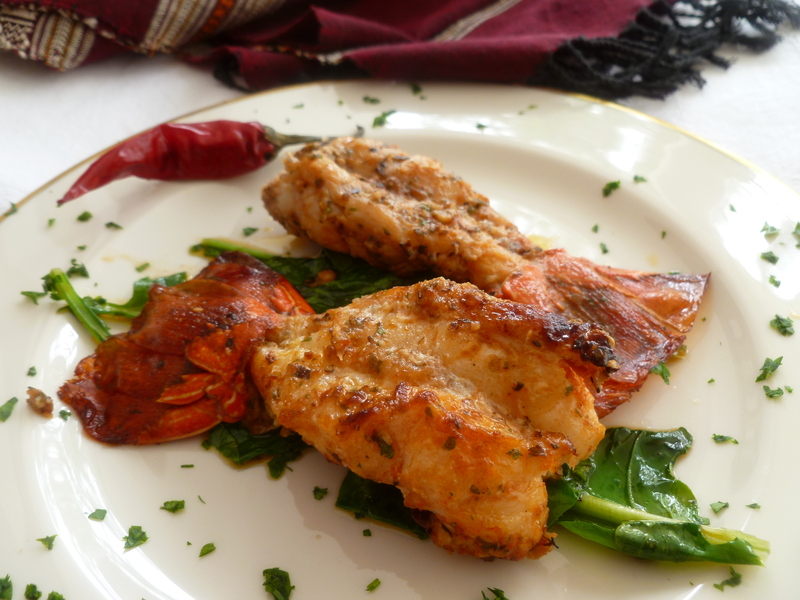 Timing Note: The rock lobster tails marinate at least an hour or more before grilling. The bamboo grilling skewers soak in water for 30 minutes. 6 cups of Roquette (aka Arugula): chopped Hakurei Turnip Greens (stems and leaves) or whole leaves of Baby Spinach may be substituted for the Roquette if the Salad of Romaine with Arugula Dressing is served in the same menu as it is in Surf and Turf Chez Laeuchli. 1. Soak the bamboo skewers in cold water for at least 30 minutes. 2. 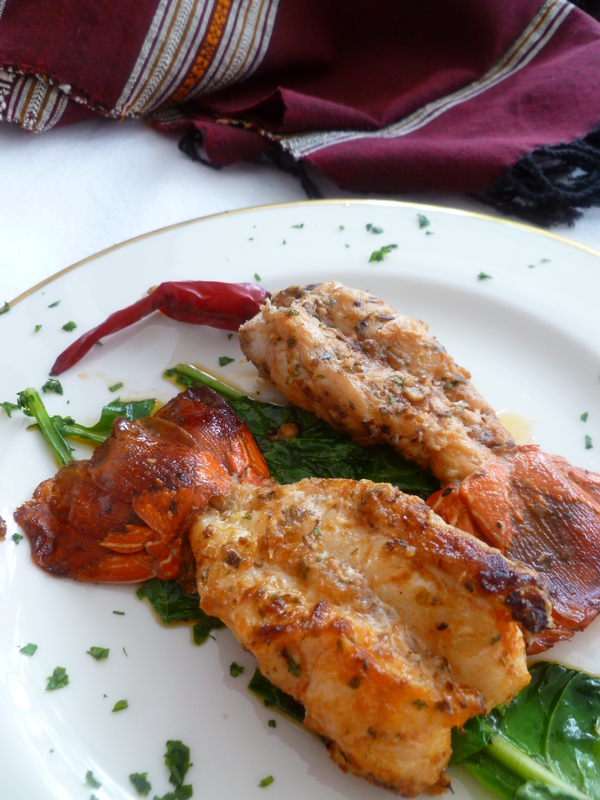 Make the marinade: Mix together the olive oil, parsley, lime juice, hot sauce, garlic, tomato paste, oregano, salt and pepper. 3. 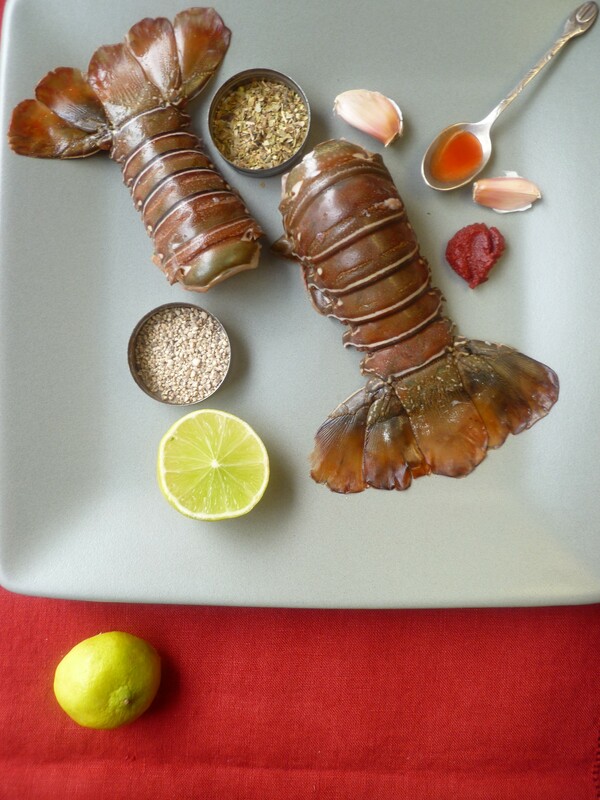 Remove the shells from the rock lobster tails, leaving the tail fan at the end attached. 4. Place the tails in the marinade and marinate them, refrigerated for at least one hour. 5. Reserve 1/3 cup of the marinade for stir-frying the roquette (aka arugula). 7. Heat the grill and when the coals are gray, grill the tails, scoring them well with grill marks on each side, for about 6 minutes on each side. Alternatively, the tails may be grilled indoors on a stove-top grill. 8. Transfer the tails to a platter and cover them loosely to keep them warm for a few minutes while you sitr-fry the roquette. 9. Mix the roquette with the 1/3 cup of reserved marinade. Heat the pan or wok over medium heat until it is quite hot and add the roquette with the marinade. Sitr fry just until the greens begin to wilt. Set the pan of greens aside. 10. 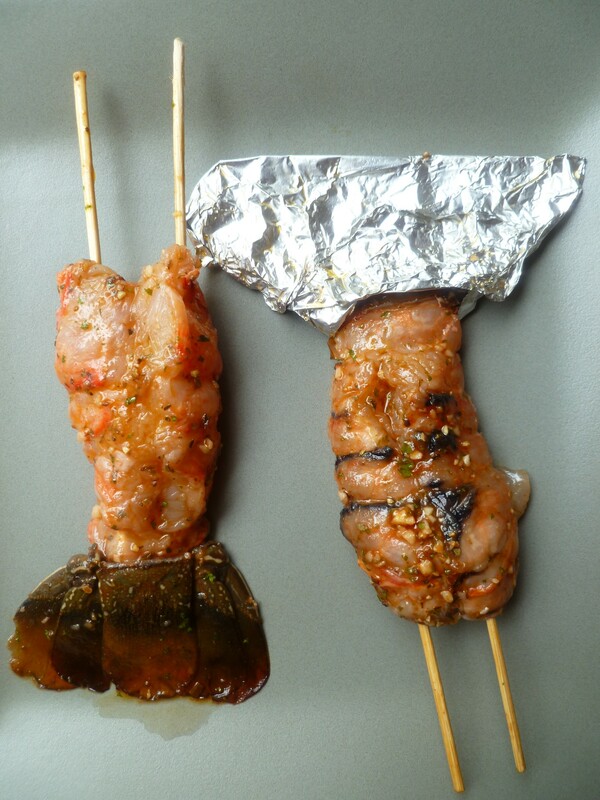 Remove the skewers and aluminum foil from the grilled lobster tails. Divide the greens among the plates and place two tails on top of each bed of roquette. An optional decoration is a sprinkling of chopped parsley and a whole pickled piment on each serving. 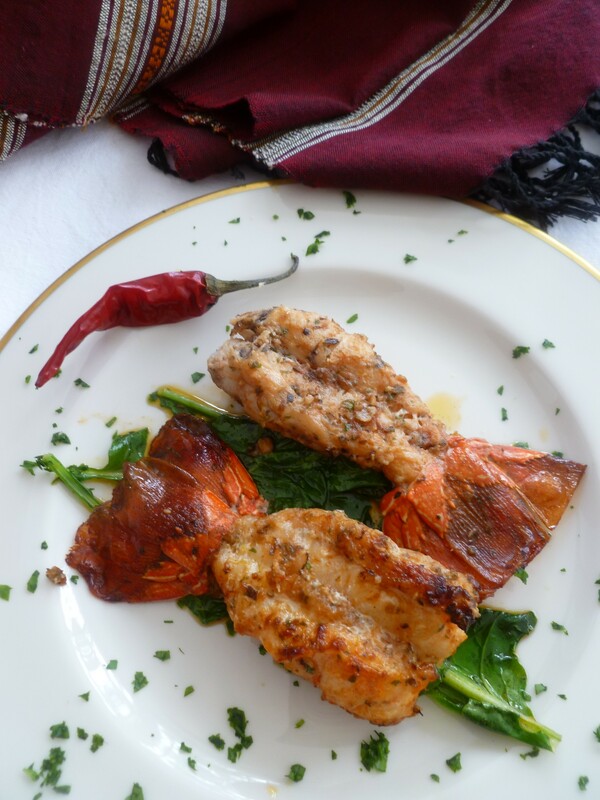 A Note: Queues de langoustes grillées Kinshasa ~ Grilled Rock Lobster Tails Kinshasa Style is the First Course of the Dinner Menu: Surf and Turf Chez Laeuchli. It will make a very good Main Course for a Light Lunch, as well.